In the 1980s and 1990s, a couple, the Wongs, ran a Chinese restaurant in Victoria, named Kym’s. It was very good, if not groundbreaking; it remains a favourite amongst those who hankered for a decent meal in the otherwise barren wasteland of SW1. Their son Andrew had different aspirations in mind, heading to Oxford University to read chemistry, but he loathed it; he initially fled to LSE to read law and anthropology, but the lure of the family business was too strong, and a few years ago, on the site of his parents’ old restaurant, he opened his own eponymous establishment, A Wong, to enormous critical acclaim and a Michelin star. Now, he is back with the ‘different second album’, situated in the new dining quarter of the Bloomberg Arcade. Great expectations; greater attainments, one hopes. After Larry and I visited, and very much enjoyed, Brigadiers in the same location a couple of months ago, I sallied down with my chum Catherine one lunchtime to see if the critics were right and that Wong had indeed come back with another winner. It’s a different proposition to A Wong; no dim sum, and a menu based much more around the traditional Cantonese arts of roasting meat, albeit with some typically Wongian twists. One orders one of the excellent pisco sours and then decides upon the appropriate plan of attack. The staff prove more than helpful in this regard, suggesting which of the ‘small plates’ (and they are indeed small) are their best dishes. Thus one finds oneself enjoying Sichuan spiced aubergine, prawn skewers encased in a kind of prawn cracker, small mushroom buns (a nod to A Wong, more than anything else on the menu we tried) and sweet and sour pork ribs. We’re recommended a bottle of Cretan white wine, the Assyrtiko Lyarakis, which is good, but the Cedeberg Sauvignon Blanc from South Africa is even better. Small plates done, we move onto the aspects of the menu that have been exciting restaurant reviewers most. 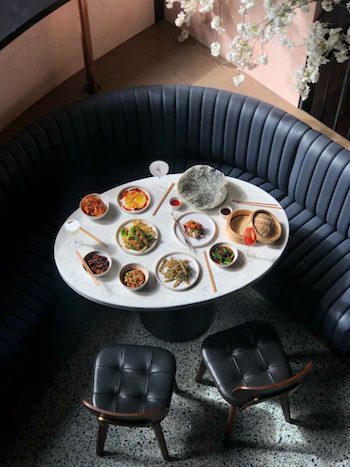 Of the sharing plates, we don’t try the crispy duck – not without regret – because we’re told to try the ‘lamb burger’ and pork and shrimp bao bao instead. Both are excellent, as you’d expect. The lamb burger is in fact a DIY series of plump bao buns that you can stuff yourself, adding a welcome sense of adventure to the meal; the pork and shrimp bao bao is a gurgling concoction which features fried egg, crispy chilli and a host of other lovely things. 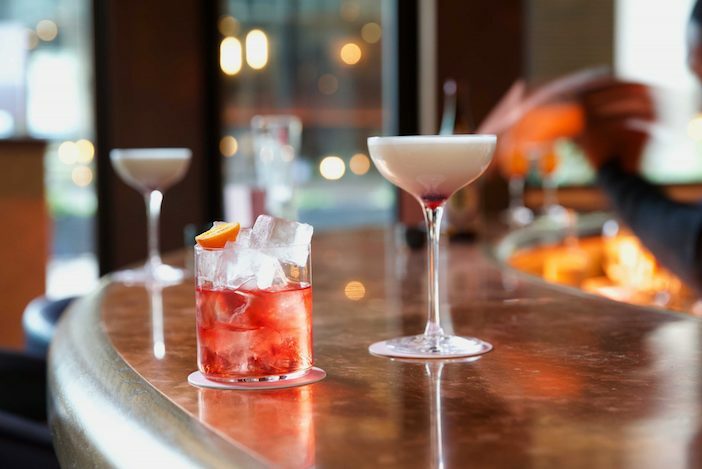 None of this is wildly expensive by City standards – £14 here, £12 there, small plates all around £6 or £7 – and if you were reasonably temperate, it would be fairly easy to have a substantial meal and walk out of here for about £50 a head, including service. This however might mean missing out on the biggest treat of them all, and in some respects the raison d’etre of the entire place, namely the three treasure. This delight is a combination of crispy pork belly, soy chicken and Iberico pork, each served with its own dipping sauce. Having tried a very similar dish at one of Beijing’s very best restaurants, and still believing that to be one of the most delicious things I’ve ever eaten, I can happily report that this is at least three-quarters as good; testament to the wisdom of using top-quality ingredients and having insanely talented chefs in the kitchen as well as Wong himself, who presumably now divides his time between here and his original Victoria restaurant. 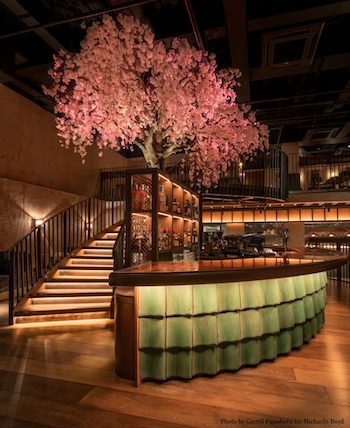 There is a lot else to commend, whether it’s the (fake, I assume) giant cherry blossom tree that dominates the room, the nicely clubby feel that’s never oppressive or the friendliness and sheer efficiency of the staff, ever keen to show us what to order but never in an overwhelming way. Kym’s has already established itself, just as Brigadiers has, as one of the estimable places to visit in this hitherto limited part of London. I would go a step further and suggest that, if there is any justice, this will become a London stalwart. Something, I think, that we can all agree on. Kym’s, 19 Bloomberg Arcade, London EC4N 8AR. For more information, including menus and details of private dining, visit www.kymsrestaurant.com.